WooThemes Sensei: The Best Learning Tool for WordPress? I love WooThemes. They make great products, their customer support is excellent and they’ve got style. My own blog runs on their extremely popular Canvas theme framework and they are the one and only theme shop I turn to when in search of a premium theme. With that in mind I tend to keep my eyes open for any new themes and plugins that WooThemes release, which brings me to the topic of this post: a learning management plugin by WooThemes called Sensei. 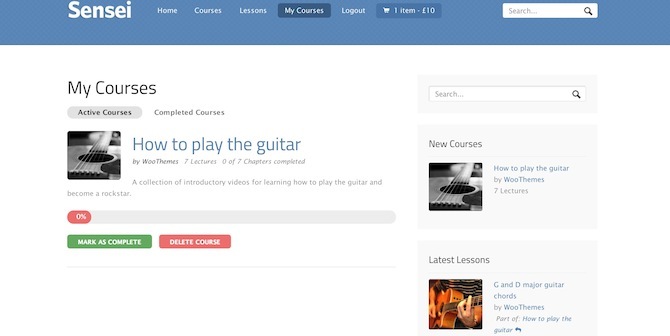 It promises to make the creation of an online learning resource simple. But the question is, does it deliver? Sensei represents everything that I love about WordPress — near-limitless extensibility. It wasn’t so long ago that purists would scoff at the notion of WordPress being anything more than just a blogging platform, but Sensei is just another example in a long line of plugins that can turn a simple blog into something far more functional. WooThemes understands how plugins should be separated from themes and as such Sensei is designed to integrate seamlessly with whatever theme you are using (as opposed to taking over). Having said that it has been designed to work particularly well with the Definition theme (seen above) so you might consider purchasing that alongside Sensei. But that’s not all. 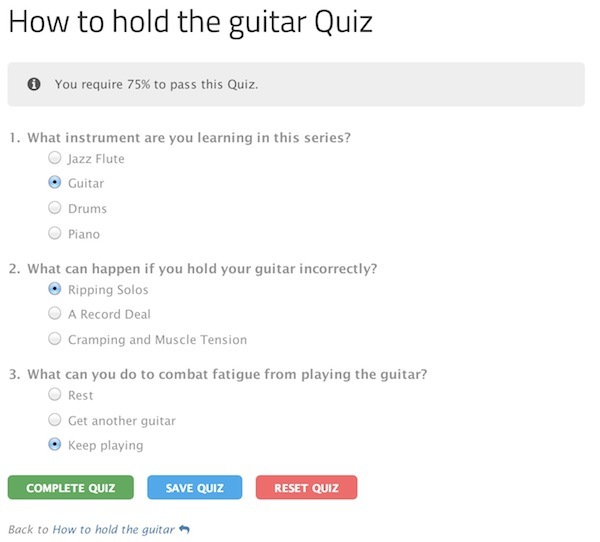 You can create quizzes to accompany your lessons and enforce a particular pass mark in order for your students to progress to the next lesson. In this way you can exert a level of control over your student’s learning but also gamify the whole experience, making it far more interactive and rewarding. In terms of setting your course apart from competitors’, Sensei could certainly give you a cutting edge. You should probably make your quizzes more challenging. It is important to note that Sensei is not a membership or eCommerce plugin and offers no such functionality as standard. It has however been designed to operate in tandem with WooCommerce so that you can charge for your courses and lessons. I would imagine that most people interested in this plugin will be looking to utilize it on a commercial website, hence its premium price tag (to match the premium functionality). In all reality, if you’re looking to build a site that will turn over thousands or tens of thousands and beyond, Sensei’s price tag seems reasonable. Creating a learning resource is something that has been on my radar for a while and having had a good tinker with Sensei I know that I would choose it for my own site. To be quite honest with you I have not come across another WordPress plugin that offers the same breadth and quality of functionality and features and doubt one will be coming along any time soon. I know I can rely upon WooThemes for top quality support down the line, so Sensei would most certainly be my choice. I’d love to know what you think so please don’t be shy — let us know in the comments section below! Next blogpost:White Hat/Black Hat: What is the Future of SEO? Content Drip is coming soon as an optional extension to Sensei. You may also want to take a look at LearnDash! I wrote about the comparison between Sensei and WP Courseware on wpdaily.co when Sensei first came out. I’m doing another review soon, but I’d say the biggest difference is that Sensei still doesn’t do the drip (or timed release) or dependency as well as WP Courseware. I applaud you for sticking up for your WooTheme love;) Some people are just naturally suspicious I guess. Very cool plugin… thanks for turning me on to it. I’ve used a few WooThemes plugins before and their platform, I must say, as you did in a comment reply that their code, functionality and support is of a high quality. Did you actually purchase the product and test it out? You’re just repeating everything from their website. It may be a good plugin, but how does it compare to the competition, like LearnDash? Wow, is this a paid endorsement? An absolute gush of unrestrained praise. Woo has been involved in some matters that have left a bad taste with some people not least to do with their forum, e-commerce history and delivery promises. A little balance here would be nice instead of presenting them as angelic heroes of WordPress. It’s not a paid endorsement — we will never and have never done them here on ManageWP. We are proud of being able to take an unbiased approach to product reviews. The simple fact is that I love WooThemes and I think Sensei is a great plugin and I get nothing in return for saying so. I’m not in the habit of reviewing plugins that I don’t like. I know we live in a cynical world but take some solace in the fact that there are still people out there who simply like stuff and have no ulterior motives in communicating their feelings as they see fit. How does it compare to Fly Plugins WP Courseware? I’m afraid I’m not familiar with that plugin so couldn’t say. I tried to demo WP Courseware, but I could never gain access to their demo. I, too, am a WooThemes user already, and the Sensei product has been exactly what I was looking for. I highly recommend it, too. Kevin, i just try the wp courseware demo. You must create a demo account, then you can login and play with the demo.